(Bloomberg) -- Australia’s central bank discussed interest-rate cuts in a review of policy scenarios at its April board meeting and concluded there was “not a strong case” for an adjustment in the near term. The Reserve Bank conceded rates were unlikely to need to rise in the period ahead and decided standing pat would allow it to be “a source of stability and confidence.” It noted the impact of further easing would be “smaller than in the past” because of high household debt and declining property prices. “Nevertheless, a lower level of interest rates could still be expected to support the economy through a depreciation of the exchange rate and by reducing required interest payments on borrowing, freeing up cash for other expenditure,” the RBA said in minutes of its April 2 meeting released in Sydney on Tuesday. Governor Philip Lowe is in a bind: the economy is decelerating sharply as consumers slash spending in response to tumbling housing prices; yet hiring and investment remain healthy and unemployment has fallen to an eight-year low. 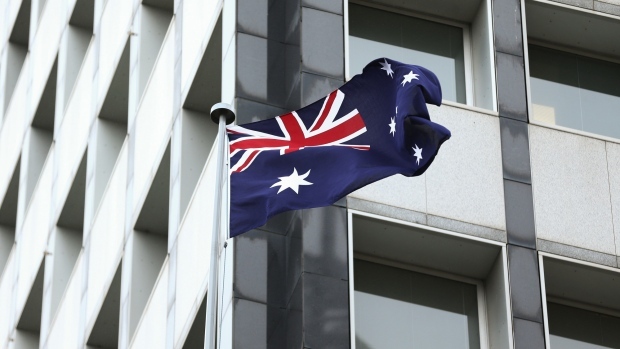 The RBA said in the minutes that other developed nations were struggling with similar mixed signals from economic activity. The Australian dollar edged lower to 71.54 U.S. cents at 11:41 a.m. in Sydney from 71.64 just before the release. While policy makers have held up the job market’s strong outlook as a reason to hold, the RBA acknowledged in the minutes that “forward-looking indicators of labor demand had been mixed” in recent months. It was referring to the contradiction between weaker results for job advertisements and stronger outcomes for job vacancies reported by employers. The RBA has kept rates unchanged at a record-low 1.5 percent since 2016 and was prepared to tolerate weaker inflation to avoid further inflaming a then-roaring housing market. Sydney prices have tumbled 14 percent from their 2017 peak; yet they’re still up more than 40 percent on their level in 2012, when the boom began. Yet policy makers seem to have acknowledged they’ll struggle to return inflation to target: on top of weak wages and intensified retail competition, governments are using administrative measures to contain prices to defuse an angry electorate. “Continued low growth in household disposable income and the adjustment in housing markets had weighed on household spending,” the RBA said. Board members noted that a pickup in household income was going to be important to achieve its central case of lower unemployment and faster inflation. “Members recognized that it was not possible to fine-tune outcomes and that holding monetary policy steady would enable the bank to be a source of stability and confidence,” the minutes said. The RBA is due to release its quarterly update of economic forecasts next month and economists predict it will lower the growth outlook after the economy decelerated from an annualized almost 4 percent expansion in the first half of last year to 1 percent in the second six months. CPI has been at or below the bottom of the RBA’s 2-3 percent target for the past few years.